Carefully enter the email address of your user account and click SUBMIT. 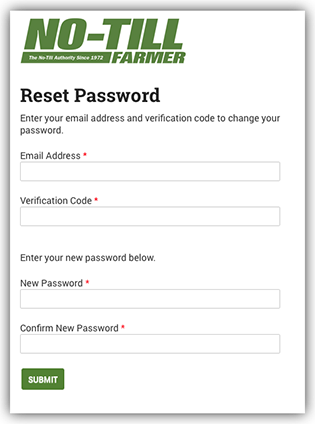 At the same time you will be emailed a verification code to the email address you enter. 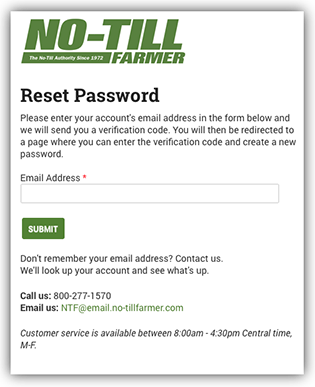 It will come from NTF@subscriptionconfirmation.com with the subject: "Instructions for changing your password to No-TillFarmer.com." If you don't receive it, then check first in your SPAM folder. You can't complete the next step in the process if you don't receive the code. You will need to contact Customer Service (contact details are at the bottom of the screen) if the verification code doesn't arrive in your email.